The delightful Riad Melhoun is a traditional Moroccan riad located right in the heart of the ancient and historical Medina quarter, within walking distance from a number of the most popular attractions and sights including the famously atmospheric Jemaa El Fna Square where snake charmers and street magicians enchant visitors, the luscious Majorelle Gardens, the Bahia Palace and the Palais Des Congres to name but a few.A typical riad, the Melhoun is set around a stunning interior courtyard with swimming pool for guests to use and relax in after a busy day sightseeing. The riad also boasts a rooftop terrace with stunning views over the local medina and the snow-capped Atlas Mountains, perfect for sunbathing and soaking in the African sun by day and stargazing by night. 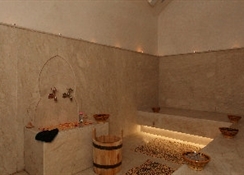 Each of the rooms are individually decorated in a traditional Moroccan style and feature a private bathroom with walk-in shower and all the amenities usually associated with a hotel of this calibre. 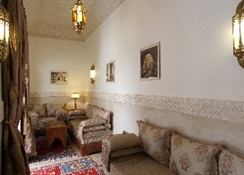 The hotel also features a traditional living room with fireplace and a lounge area with books for guests to relax in, perhaps making use of the Wi-Fi connectivity available in most of the public areas. For dining there is a restaurant serving a range of traditional Moroccan and international cuisine plus there is also a bar lounge area for guests to relax with their favourite beverage of an evening.Additional amenities include room service, currency exchange, tour desk, luggage storage, concierge service, laundry, ironing service, meeting and banquet facilities, business centre, gift shop and parking nearby for those arriving by car. The Melhoun is ideally suited to those seeking a luxurious stay right in the city of Marrakech, in a residence offering a true experience of Morocco. The hotel boasts a unique courtyard swimming pool for guess to enjoy, along with a variety of massage and spa treatments for those seeking the ultimate in relaxation. 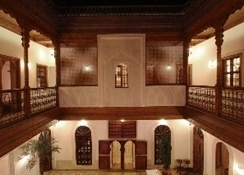 Each of the rooms are individually decorated in a traditional Moroccan style and feature a private bathroom with walk-in shower and all the amenities usually associated with a hotel of this calibre. Certain amenities may be payable locally. This riad is ideally located within the exotic city of Marrakech-a city split into the old town and the new town, this cultural metropolis boasts a number of cultural attractions and open-air markets filled with live entertainment. At night the city comes alive, offering exotic food, vibrant nightlife and a truly unique atmosphere.